GODZILLA: Body armor, radioactive energy, breath weapon, super strength, massive size, high intelligence, tail whip, claws, teeth, and charisma. BUDDHA: Reincarnates, simultaneous manifestations, very calm, has consciousness in such a high connection with the universe that reality is easily altered, high intelligence, super strength, charisma, and big big love. 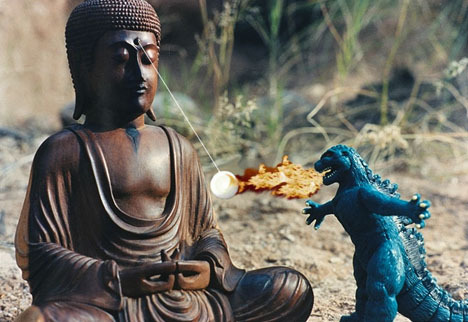 Buddha seems to have a pretty heavy advantage with the reincarnation angle, but Godzilla's been known to surface again and again after death seemed a certainty. Both are legendary -- in fame and for being misunderstood. Perhaps side by side or working as a team they could become better understood. Relationship to the Core Wave: "Buddha builds inner truth? Godzilla destroys fictional Tokyo? Do our spiritual or cultural beliefs unite us or seperate us or both?" --r.c.c.